On Saturday morning, I woke up to numerous messages on whatsapp and facebook from my friends in India asking me if my family was safe. After listening to a voicemail from a Nepali friend based in Boston, I found out about the earthquake that had hit my country. It didn’t take long after I turned on my computer to see how big the devastation was. My heart sank to my stomach and I was in tears as I mindlessly added credit to my Skype account and repeatedly dialed my parent’s mobile number. After multiple tries, I was able to get in touch with my family. While I cried throughout the entire call, I was reassured that they were all safe. Fortunately, my family survived this terrible tragedy and was able to stay safe in tents in open spaces near their neighborhood during the more than 100 aftershocks. Unfortunately, however, the 7.9 magnitude earthquake that struck Nepal has swallowed up whole neighborhoods, villages and along with it thousands of people. The death toll is rising as we speak and is estimated to reach around 10,000. Shortly after the earthquake, many phone companies and messaging apps started providing free calls to Nepal. Viber, Skype, and Google Voice are allowing free calls to mobile and landlines in Nepal along with many other phone companies like AT&T, Verizon, T-Mobile and others. This may seem like a small gesture but for a Nepali living abroad, it is a huge relief to be able to constantly contact family members and people requesting and responding to the crisis during this tragic time. 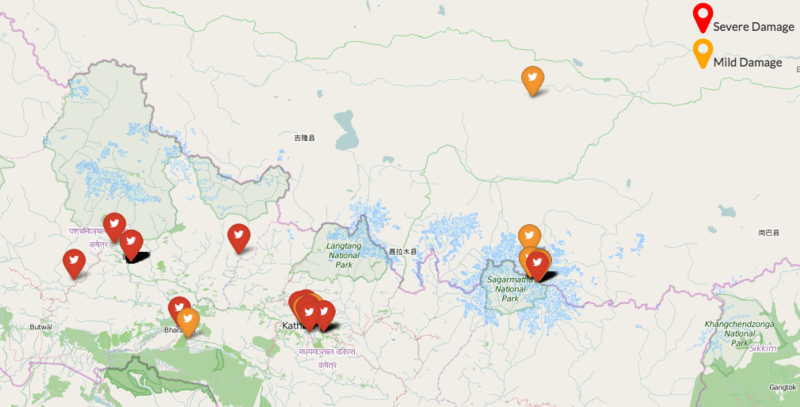 Numerous mapping communities have deployed their teams online to map the crisis in Nepal so that the pleas for help can be detected and resources delivered. I have joined two Atlas Corps Fellows, Medha Sharma, and Luther Jeke to team up with Standby Task Force to help map the affected communities in Nepal by using MicroMappers. Medha and I have reached out to our Nepali networks in and outside of Nepal to help advise the SBTF team by relaying information about ongoing requests for help or offers of assistance. We are also helping translate Nepali tweets, facebook updates, and news articles so that they can be mapped. We have recruited more than 100 Nepali expats and residents to help us with this effort. Two days ago, I was able to call Dr. Anil Shrestha in Bir Hospital to notify him that we saw his request for a list of medical supplies through Facebook and found a donor willing to provide them. We have connected the two parties and are awaiting confirmation from Dr. Shrestha that he has received the supplies from the Kathmandu airport. You can read about the Standby Task Force’s other small successes here. If you would like to join the SBTF team or have experience living in Nepal and know the community, please email me at samita@techchange.org to join this effort. Kathmandu Living Labs is leading the mapping efforts on the group in Nepal, but you can also join the mapping effort for Nepal relief with Maptime DC, Tomnod, or Humanitarian OpenStreetMap. Many organizations and individuals have started fundraisers online to allow the global community to help in Nepal’s recovery. Two of the alumni from my high school have started a fundraiser on Indiegogo that will direct the funds to local NGOs that may not have connections outside of Nepal to raise a lot of money. Unmanned aerial vehicles or drones, are playing an important role in the response to the earthquake in Nepal too. Because of a shortage of manned helicopters, the effects of the earthquakes in the most rural parts of Nepal are still unknown, and this is where drones will step in, allowing manned helicopters to continue with rescue missions. Here is a drone footage of Kathmandu after the earthquake taken by Kishor Rana’s drone. UAViators founder Patrick Meier said that if you have a drone and want to help, get in touch with the Humanitarian UAV Network and read the Network’s Code of Conduct to help with this effort. This is the worst earthquake to hit Nepal in 80 years, and the many pictures online show the devastating effect it had on my country. The damages are worst in the areas that have not yet been reached by media or rescue teams. The consequences of this tragedy will affect my country long after the media turns its attention away and we need all the help to rebuild. If you are a mapper or own a drone, please volunteer your time and skills and join one of the online communities. You can also donate online. You don’t have to go to Nepal to help, in fact, please don’t, unless you are a trained professional for crisis situations. You can do your part to help Nepal with the help of ICTs from wherever you are. If you are interested in learning how social media and technology is helping in disaster response, join us in our upcoming course on Technology for Disaster Response that begins on June 22.